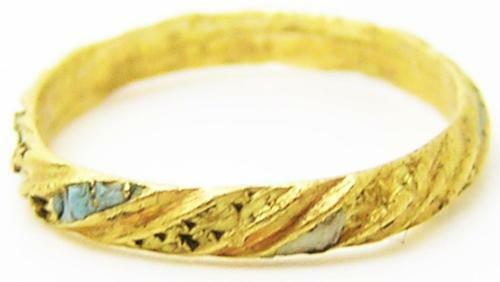 This is a wonderful Tudor / Stuart period gold finger ring, dating to the 16th - 17th century. the ring is decorated with a cable twisted band, set with alternating bands of white and blue enamel. The inside of the ring bears the initials G.E.D. The ring is a salvage find, it has lost much of the original enamel (due to the actions of the sea water). Such small rings were often carried by sailors, worn on a leather cord around the neck. To act as an insurance policy, for the payment of a decent Christian burial (if the sailor lost at sea and washed up on a shore). The initials, in this case, may refer to the family member, spouse or sweetheart who originally gave the ring. Due to the location of the find and date of the ring, this piece may be connected with English or Dutch colonists or privateers.